Homographs are words that are spelled the same but have different meanings. They can be tough for young learners, so enjoy these fun Homograph Puzzles to help teach the skills! Each word comes with two images to show its two meanings. You can cut apart the images to play a little matching game. Students will match image with homograph. They are perfect for elementary age students and can be used for lessons in a variety of ways! 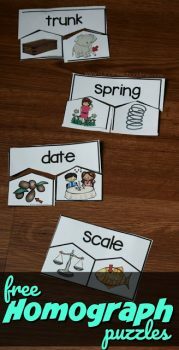 For work with homonyms, check out these Homonym Puzzles. To get other word puzzles resources, look at Compound Word Puzzles and more! Click here for your FREE Homograph Puzzles!